A family owned and run business. They proudly boast an attitude of pride...providing their customers with quality service. 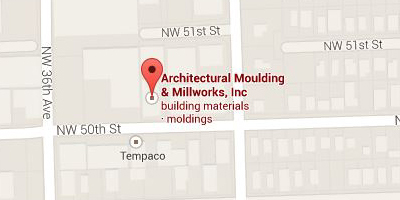 Your crown molding Miami company, Architectural Mouldings & Millworks, Inc is what mouldings are all about. We have made an art of supplying columns, mouldings, doors, flexible moulding in South Florida. Within our products catalog you will be impressed with our extensive product line. From columns to mouldings, from crown mouldings to frame mouldings, from architectural columns to spinal columns, and a vast array of other products will provide you with all your decorative needs, offered by the top baseboard molding Miami company, Architectural Moulding & Millworks, Inc.
What accounts for our booming growth? Well one would have to say hard work, dedication, superior customer service, and the highest quality mouldings, columns and architectural products; just to name a few. Word of mouth by our satisfied customers has built our business. There is no better advertising than a satisfied customer. Your custom doors Miami company, Architectural Mouldings & Millworks, Inc offers baseboard & crown molding, interior doors Miami, columns, mouldings, door hardware Miami & more. Call 305-638-8900 today. Since 1996, Architectural Moulding & Millworks, Inc - has been a leader in the Design and Manufacture of Embellished Hardwood Mouldings and Handcarved Woodcarvings for the Millwork and Kitchen & Bath Industries. We offer over 2,250 embellished profiles including mouldings, corbels, onlays, cabinet parts, mantels and more. These products are in-stock for prompt shipment. © Copyright 2010-2018 by Architectural Moulding & Millworks, Inc. All rights reserved.